When you are looking to upgrade your home while maintaining a traditional appearance than Flooring America by CarpetSmart has the solution. 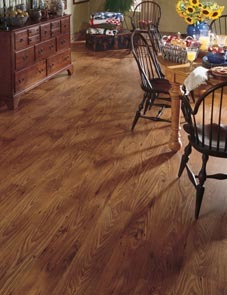 We offer engineered wood in Springdale, AR, which is a great hardwood flooring option for your home. Made by layering thin pieces of wood, engineered hardwood flooring is designed to expand and contract when exposed to moisture or humidity. This ensures that the flooring does not crack or shift when it gets wet, allowing it to be placed in any room in your home. In addition, we also offer solid hardwood options to complement our engineered solutions. Visit our expansive showroom to explore all the wood flooring options we have available and let our staff help you choose the right ones for your home. No matter which flooring option you choose, they both add elegance to your home with their natural and timeless beauty. By investing in hardwood floors, you significantly increase the value of your home while creating a warm and inviting space for you and your family. Additionally, hardwood is extraordinarily resilient and designed to last when taken care of properly. It can be refinished multiple times allowing you to keep that fresh look it provides even longer. With the added moisture protection that engineered surfaces provide, hardwood is still the premier choice for any room in your home. When you are replacing your home’s flooring, it is a great idea to consult with our design experts. Our team works closely to help you choose the right flooring option for your home. We make suggestions based on your current or planned décor and help you select the right wood flooring to match. With our collection of wood, there are a number of species and stain colors to choose from, giving you a countless number of style and design choices. Additionally, we carry different cuts and shapes to allow you to do geometric patterns as well as standard planks. After you purchase our expertly crafted solid or engineered wood flooring, you need to have it professionally installed. At our store, we are proud to offer installation services for your new flooring. Our team of installers has the experience and tools to handle any flooring project while ensuring that your new floors look great and last for years. Additionally, we advise you on the proper maintenance of your floors and give you information on prolonging their life. To learn more about our installation services or to schedule an appointment, reach out to our showroom; we are always happy to answer your questions and get you ready for your new flooring installation. Contact us to choose from a number of fantastic hardwood flooring options. We serve Springdale, Fayetteville, Lowell, Cave Spring, Siloam Springs, Arkansas, and the surrounding area.